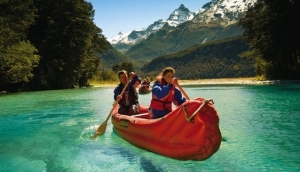 One of the areas's most popular activities, Kayaking in Queenstown is available around every watery corner. Lake Wakatipu is the perfect wide open space on which to indulge this most peaceful of pastimes. Solo and guided trips available. Queenstown Kayaking is a great way to explore the stunning Lake Wakatipu, and the slower sections of the Kawarau and Shotover Rivers. Whether you're a first timer, or experienced canoeist, there are great facilities here. Queenstown operators can provide half and full day 'eco excursions', which are great for finding out more about the landscape you're paddling in. In Glenorchy, Rippled Earth will take you to the conservation areas of Pig and Pigeon Islands, and include lunch on the beach. Close to the centre of Queenstown you may prefer a paddle around the shores and secluded coves of Lake Wakatipu - real water therapy.